​When parasites die off in the body, as they are transported out they become 'stuck' within the liver. Other waste products collect around them and they become stones. 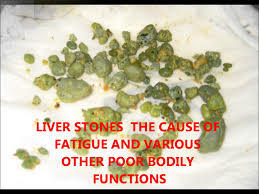 Everyone has these in the liver. When the liver becomes full liver function is decreased. Here below is the most effective cleanse.